I’ve really focused on sound/audio quality for my videos and pretty much all of the content I do. That’s an ever-changing process since I’ve come across other things that work better, and I just get better at using all of the equipment that I have. Part of that is wanting to constantly improve the quality of sound in my voiceovers and for the podcast I record with some friends. The acoustic foam I used is 2” thick stuff, and seems to do a pretty good job so far on the few tests I’ve conducted. I’ve linked to the exact acoustic foam panels I used below, in case you wanted to pick up some for yourself. This project started some time ago and has been worked on in the background while other things are happening in my shop. When I started it, I didn’t fully know what all I wanted to use as far as materials. I just had a general idea of how I wanted it to look and function. So, that was one of the first steps…conception. Conception of an idea might seem to be pretty easy, but it is really pulling out all of the elements that you actually can and will use in a project. 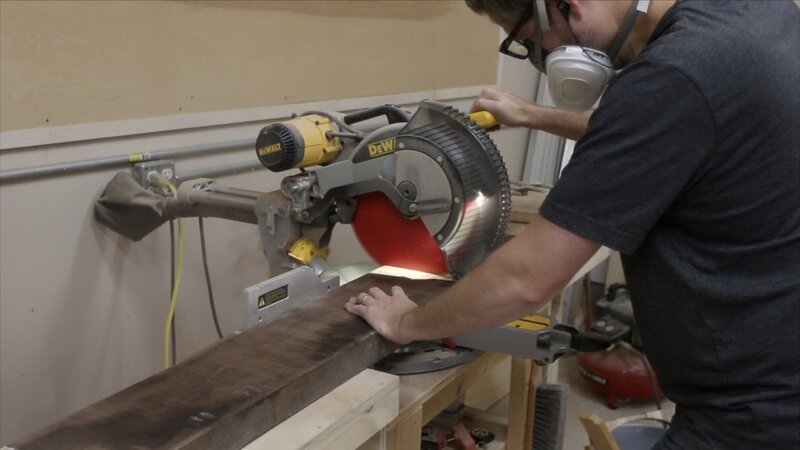 It takes the project from an initial idea in your head to being on paper, telling what materials to use, what types of finishes, how to use it, etc. I should probably start doing kind of a brainstorming type of session for this, and write it all down. I think that would help me. I used American black walnut for this project, and the only pieces I had were from a single 2” thick piece of walnut. Nothing on this project needed to be 2” thick, so I resawed it in half to get all of the pieces for my panels. I was shooting for the panels to end up at about 1/2” thick for the finished piece, so I kept them a little thicker at the start. After resawing them on the bandsaw, I ran them through the planer to get a finished side on both faces. Then, I took them to the jointer to get one clean, flat edge so they would glue together nicely. I also needed some pieces a little thicker that would make up the box type of compartments. So, I went through the same milling type of operations on those, but just left them thicker than the other pieces. For each of the cavities, I made a box. I had not ever tried out making box joints (sometimes called finger joints), so I figured this was the perfect time. 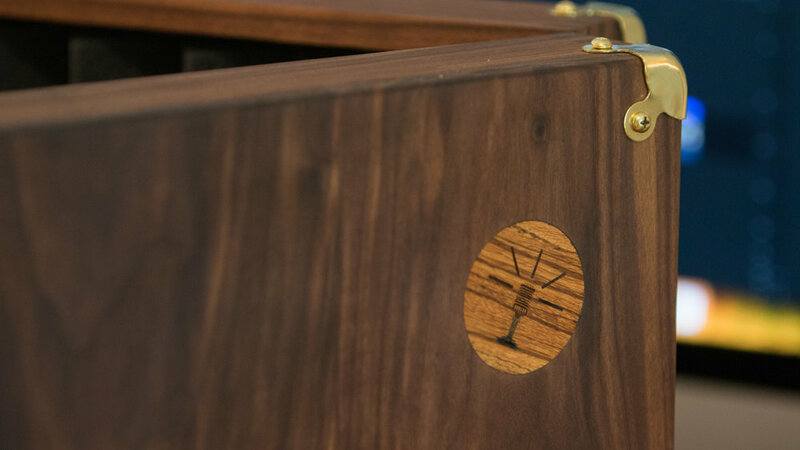 So, what is a box joint? If you picture taking your two hands, and clasping your hands together, interweaving your fingers…that’s how a “finger” joint works. I might go into even more detail about box joints in a separate post, so I will just leave it at that for the time being. Gluing together all of the box joints was a pretty challenging task. The most challenging part was making sure they were as square as possible. This was probably the most stressful glue-up that I’ve done to this date. If you’re asking yourself, “How can gluing something together be stressful?” well, just try it. When you’re gluing together multiple parts and before the glue gets tacky, you have to get them pretty right. 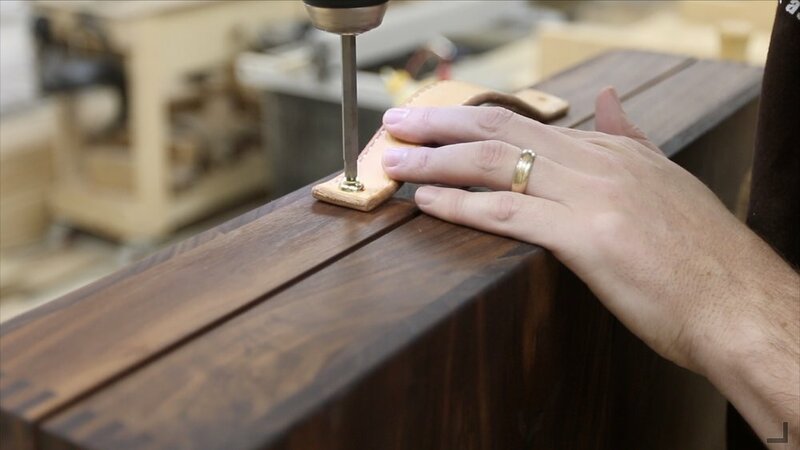 Plus, you don’t want to get wood glue absolutely all over your work piece…it could affect the finish and be hard to clean up. Anyway, I think my box joints were a little too tight, so that by the time glue was added, they were incredibly tough to go together. I even had to hammer some of them, and that threw out the alignment as well. It is very important for your boxes to remain as square as they can. That will really make things easier later on. 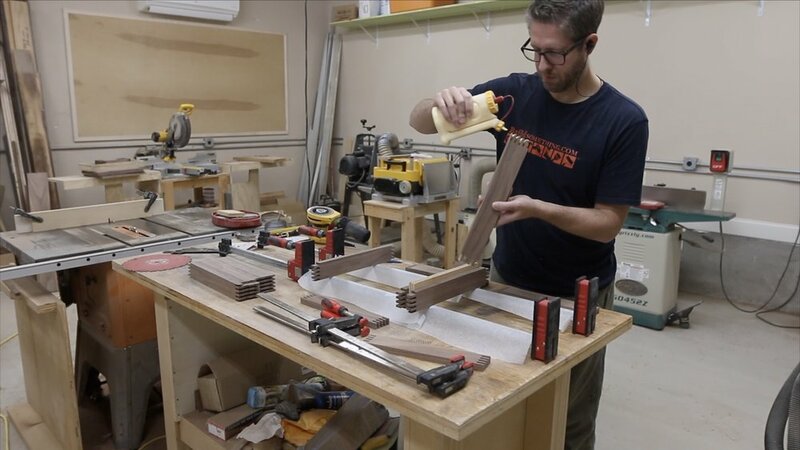 Remember the walnut that I resawed into thinner pieces? I needed to glue some of them together to make panels, since they were not wide enough. 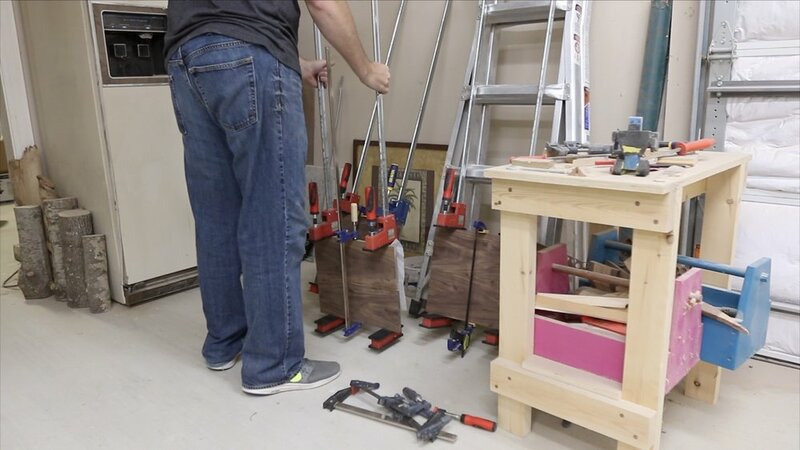 After all of the milling process, I used some of my parallel clamps and a sparing amount of glue and clamping pressure to glue them together. You don’t want to use too much clamping pressure, because it is easy to warm your pieces. You’ll end up with something that looks more like a potato chip than a panel for your project! After the panels came out of the clamps, I sent them and the boxes through the drum sander to clean them up just a bit. Then, I just used a random orbit sander to clean up the box joints until they were flush. While the glue was drying on some of those other pieces, I went to my laser engraver and engraved and cut out a little token with a microphone on it. I thought this was befitting of an inlay for this project. It was finally time to start putting it all together and see some of the shape take form. I laid out the panels to see which side I wanted to be the “show” side, and then glued them to the boxes. I just use a long piece of wood across them and some weight (heavy pieces of steel in this case) to hold them down. I left a little extra on the panels, because I wanted to get them exact with the boxes. I trimmed off most of the excess at the bandsaw, and then used a flush trim bit in my router to take care of the rest. I’m really pleased with how they looked at this point. 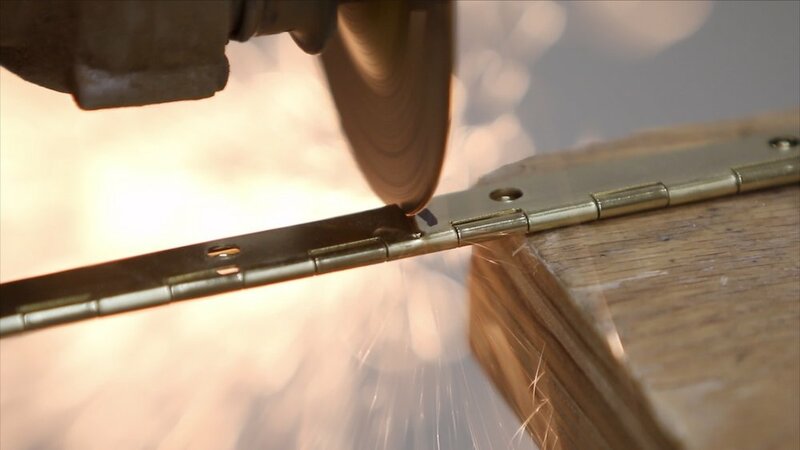 I’m using some continuous hinges (also called piano hinges sometimes) for the doors of this piece, so I bought one long one, and I’m just cutting it down with my angle grinder. I marked out how long each of the pieces needed to be, and then I cut them using a cutoff wheel on my angle grinder. Pretty simple. Be sure to clean up the burr that is left…just use the grinder gently to smooth those out. Don’t do too much if you’re using brass plated ones like I am, because they’re just steel underneath and the color will be different. I marked out where each of the screws would go, pre-drilled those holes and secured the hinges with some screws. You have to be careful with brass screws because they are not very strong. I would not recommend using an impact driver, but rather, just your drill or do them by hand. After adding the hinges to the doors, I realized that in order to have an even gap at the top, I needed to add a piece to the inside. That way, the doors would hit that and stop, and not fold inward even more. I just used some more of that zebra wood, like the piece I used to make the microphone token. I cut it out on the bandsaw, sanded it and then secured it to the mic surround. On the first pice, I just used wood glue. It kind of slipped around and made a mess. On the next one, I used a bit of wood glue in the center of the piece, but then added some drops of CA glue around the outside, and I sprayed the surface I was sticking it to with the CA glue activator. I’ve seen people do this before, but I’ve never tried it until now. It worked great! I took the panel that the inlay would be set into over to the drill press, and used a forstner bit to hollow out a little hole. I went slow here, checking as I went. I wanted my token piece to be just above the surface of the panel, so I could sand it flush and get a perfect fit. When gluing it in, there were tiny gaps around the outside edges, so I just used a bit more glue, and some walnut dust from sanding to mix together a paste. Once that dried, I sanded it all flush and it worked quite well. In a previous project, I made a leather, saddle stitched handle for this mic surround. Go check out that project if you haven’t already. All that I had to do to get the leather handle ready to secure it to the mic surround was to trim up the length, and punch some holes in each end. I’m just using some brass washers and screws to secure the leather handle to the top. 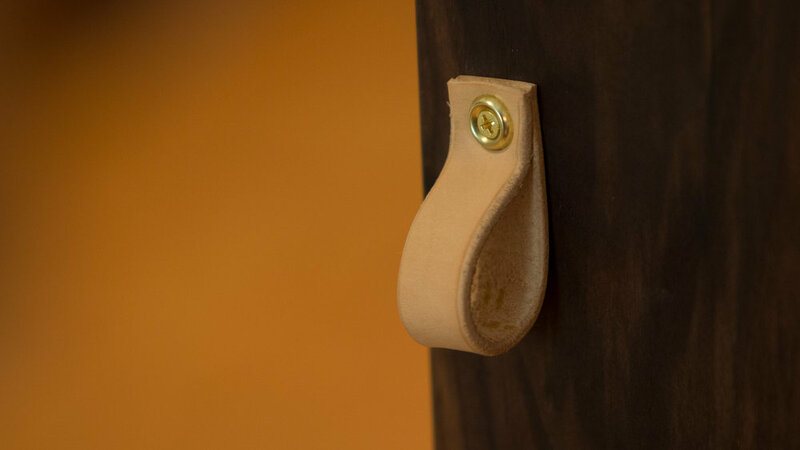 I wanted to use these cool brass handle straps that I picked up, but as my design morphed, those would no longer fit. I’ll have to find something else to use them on. For the front, I made some little leather pulls. I just cut some leather strips, burnished the edges and secured them to the front after marking out where the center is. I used the same brass washers and screws as on the handle on top. I picked up some brass corner pieces that look like an old, vintage amplifier. I couldn’t wait to get them on here to see what they would look like. But first, I had to file down the corners to be a little more round. I just used my rasp and rounded over the corners on the top a bit until the brass corner pieces would sit nice and flush on all of the other sides. 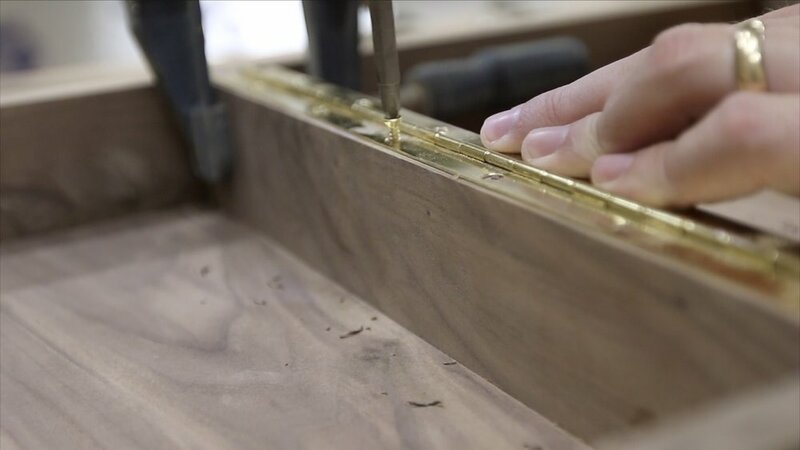 Be careful when filing that you don’t go against the grain too hard…it could splinter out the wood on something you’ve worked so hard for already. Then, I just marked where I needed to drill for each one of the brass corners and pre-drilled the holes. I’ll secure all of these after I apply finish. What is acoustic foam exactly? It is just some dense, sound-absorbing foam with some patterns on the front of it, helping to break up sound waves. This is used in a lot of recording studios and offices where people do audio work like voiceovers and podcasts. The panels I got were 2”x12”x12” and they seem to be doing a great job so far. I’ve done some tests with it, and they really seem to help the echo and bounce back of sound in the room as I’m talking. My actual compartments in the mic surround ended up being a little narrower in one direction, so I just marked out how wide I needed the acoustic foam panel to be, and cut it with a knife and ruler. After some hand sanding, it was finally time to add some finish. I’m using Mahoney’s walnut oil again on this project. It came out a little darker on the walnut than I thought it would, but I’m still really pleased with the outcome. It is such a simple finish to use. 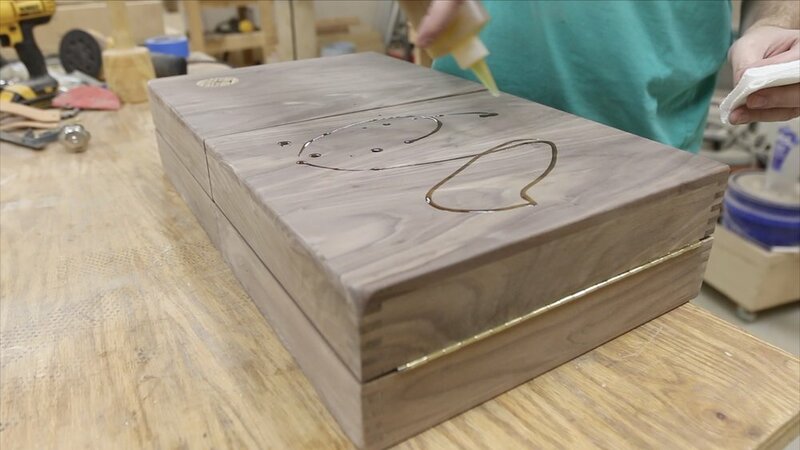 You just wipe it on and rub it into the wood, let it sit for a little while, and then wipe off any excess. Then, it dries in a few hours and leaves you with a really nice, low sheen finish. I decided to add some neodymium magnets to both parts of the door to assist with keeping it closed while I moved it. To do this, I drilled out some little recesses until the magnet would be flush. Then, I used some CA glue and activator to secure the magnets. They are just the right amount of hold to keep the doors closed, but not too much that I struggle to open the doors using the leather pulls. At this point, it was time to add back all of the hardware and leather accents. I just screwed all of them in, and this piece was done! I’d love to hear what you think about this mic surround. Leave me a comment below and tell me if there is something different you would have done in the construction or using different finishes and accents. If you haven’t already, go watch the video I made about this mic surround project. I think you’ll enjoy it, even after reading through these steps. Thank you for following along and for the support!